For over 30 years in the market, Impex Tecniche Lineari specializes in the design and manufacturing of Movitec Linear Systems. The wide range of solutions offered and the rapid customization and development of special solutions make these systems suitable for many applications. 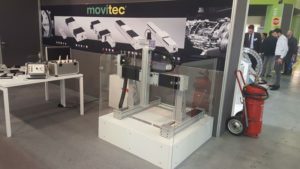 Movitec products are present all over the world in traditional industrial machines, in automotive or welding assembly systems, in robotics, in research institutes specializing in particle research and in biomedical projects and are delivered complete with motors and drives. The various products range from micro linear tables type LV with miniature components designed for microelectronics, biomedical and prototyping sectors where the compactness of the product goes hand in hand with the precision of positioning to move even high loads into reduced spaces. You go through the standard linear tables with TV screw drive, also produced in C45 steel for grinding machines, or TP type with pneumatic cylinder drive. Recently, Impex Tecniche Lineari has implemented a pick-and-place unit together with ZF Italia, a partner that enables the delivery of complete solutions. Various sizes of Bi-Rail linear modules with Yaskawa motors, complete with control cabinet, were used. The system consists of a double X-axis with Bi-Rail Linear Modules MCP130 with toothed belt drive, only one of which is motorized. The Y-axis is a Bi-Rail Linear Module MVP160 with spindle drive Ø 20, pitch 50mm and the Z-axis is an MVP130 with spindle drive Ø 16, pitch 5mm.